I don't remember old one running that hot. It is pulling 4.8a or so. Input voltage is 251+ but that is normal here. A little follow up. I checked my neighbor's pump, on the same transformer as me, he is running 140 too. The guy down the street is 131 or so but I am not sure what his voltage is. New motors tend to run a lot hotter than the older ones. To cut costs, manufacturers put less iron and wire into motors nowadays. Some also wind with aluminum rather than copper. They can get away with this to some extent because modern insulation materials can operate at high temperatures better than old varnish/fishpaper could. 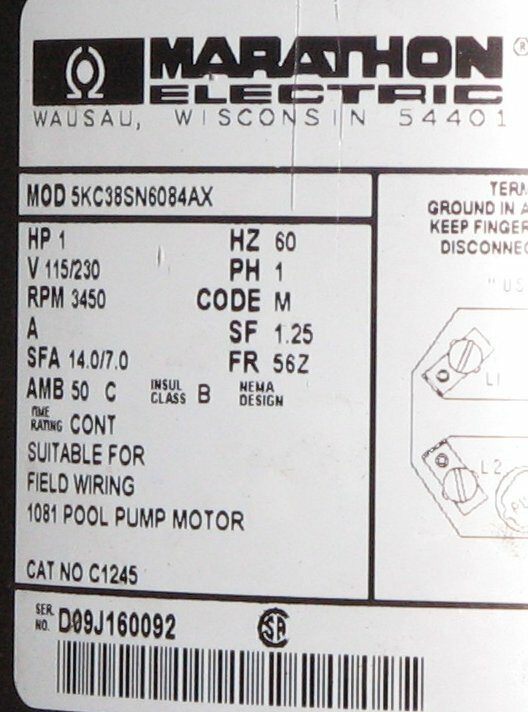 The motor nameplate may provide Temp Rise and/or insulation class ratings. These may provide a clue whether "hot" is "too hot". The temp rise listed is above ambient, so some motors can operate quite hot under normal use. I am sure the ambient is part of the problem. This was sitting at 88-89 before I turned it on. Yeah that the part of issue and is the sun is " beating " on the motor like sun is shining on the motor ? If so that can raise some of the tempture a bit. I know the tempture rise will start at the ambenit tempture plus the nameplate for tempture rise so that you add them together it get pretty hot side. This is on the south side of the house but it does get some shade right over the motor. Did you ever make a little roof or dog house roof above the pump motour ? if not maybe try that idea that will help a bit there. The motor is in the shade. I have pan roof over the whole thing. The insulation Class B says internal temp can be up to 130C. I am still not sure how that translates to the case temperature since there is some cooling going on. Unfortunately these are 3R rated motors so there are no vents on the top of the case. Since my neighbor's motor runs at virtually the same temp I assume it is normal but I am wondering how much money I am wasting. I bet a high efficiency motor runs cooler. This was the one the pool store stocks. If I had more time I would have shopped around at a real motor supplier but it was dead. I don't see any "rise" or hot spot allowance listed on there, merely a note that it's rated to 50C ambient temp, which is awfully hot, even for Florida. Class B insulation should not be exposed to temperatures over 130C (To clarify for anyone skimming: that's not 130F, but 130C). 140F operating temperature is not an issue; you could fry an egg on the motor, and it would still be OK. So I guess it is safe, even if not all that efficient.